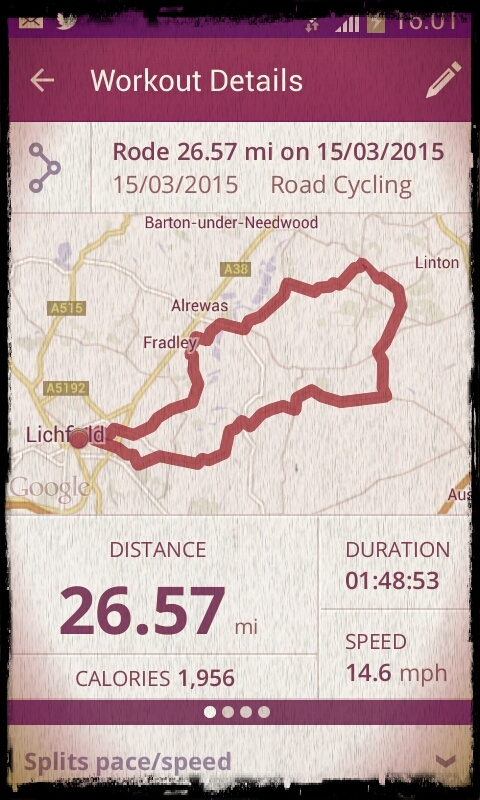 I rode Racelite 8 with MapMyRide+! Distance: 26.6mi, time: 01:48:53, pace: 4:06min/mi, speed: 14.7mi/h. Dry and cold: so took the summer bike out for the first time this year. It was more a test ride than anything. I certainly did not have energy to do anything ambitious. It handled well but gear changes were heavy. That cold easterly didn’t help. It’s going to take ages to warm up after. It’s times like these I wish there was a bath in my house. Chores for later: with a good selection of cleaners and oils, this bike offer neglect reversal. The rear mech is bunged up with dry black paste. The cables seem worst, dry lube is good for that. I didn’t find dry lube works well on a chain (maybe on a track bike). This entry was posted in Cycling and tagged Summer bike. Bookmark the permalink.